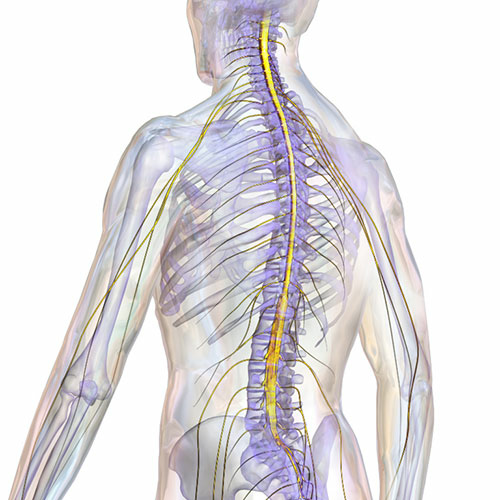 A spinal cord injury involves damage to any of the nerves in your spinal canal or to any part of the spinal cord. These types of injuries will typically cause permanent changes in all bodily functions, sensations and strength below the site of the injury. However, recent research has progressed to allow people with spinal cord injuries to lead independent and productive lives. Spinal cord injuries can be the result of a trauma that dislocates or crushes one of your vertebrae, like a car accident, fall or gunshot wound. A non-traumatic spinal cord injury can be caused by conditions such as degenerative disc disease, cancer or arthritis. Immediately after a spinal cord injury, it is imperative that the patient be kept stabilized until they can get medical attention. Treatment for the injury will begin right away to minimize the amount of trauma done to the cord. After the injury, your symptoms will depend on the severity of the injury, and where on your spinal cord the damage is located. The injury is considered complete if a majority of your sensory and motor abilities are impaired; it is incomplete if you still have some degree of motor and sensory abilities. Your doctors will need to perform a series of tests over the course of a few days to determine if your injury is complete or incomplete. Following the injury, your doctors may use various IV medications that have been shown to decrease the inflammation at the injury, which can lessen the damage done to the nerve. Surgery can be used to remove any foreign objects or bone fragments that may be causing more damage, or to stabilize any vertebrae. As there is no way to reverse the damage done to the nerves after a spinal cord injury, a majority of treatment is heavily focused on preventing any more injuries and helping the patient to live a comfortable and productive life. Rehabilitation and physical therapy will be very important for your ongoing care and treatment plan, and will include working on your fine motor skills and strengthening muscles so you will be able to get back to your daily activities as soon as possible, and resume your regular routines as much as possible. Thanks to today’s modern medicine, many people with spinal cord injuries can now lead independent and productive lives. If you or someone you know is currently suffering from a spinal cord injury, the doctors at the Florida Spine Institute will be happy to provide more information about available treatment and rehabilitation plans.